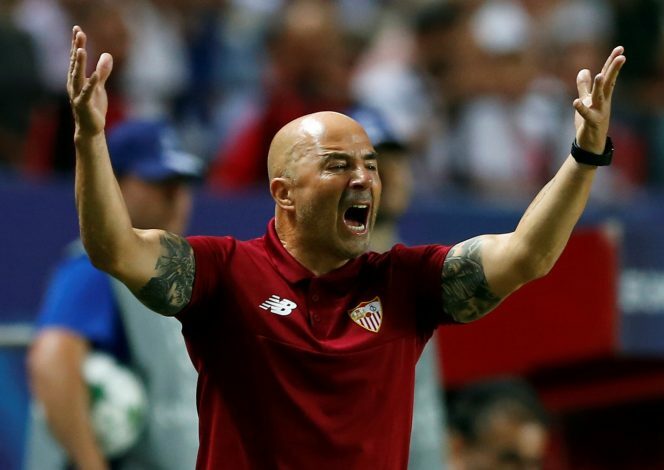 Sevilla boss Jorge Sampaoli has refused to rule out the chance to manage Barcelona after having been tipped as one of the main contenders to replace Luis Enrique at the end of the season. The former Chile boss claimed his main focus currently on the Europe League winners but also confessed the future is always uncertain. Luis Enrique’s contract at Barcelona will end this summer, and his position at the club has come under severe criticism following the shocking 4-0 humiliation to PSG in the Champions League Last 16 tie. Spanish media claim Sampaoli, Athletic Clubs’ Ernesto Valverde and Everton manager Ronald Koeman are on the shortlist of candidates to take charge at Barcelona if Luis Enrique decides leaves. Yet, Sampaoli was coy when questioned over that possibility, as Sevilla remain his main focus now, with the Andalucian team being sit in the third spot of La Liga table, only behind Real Madrid and Barcelona themselves. “This type of media speculation doesn’t help clearly evaluate all that Luis Enrique has achieved. Barcelona’s bench will be vacated whenever Luis Enrique decides what to do,” Sampaoli said, as quoted by AS. Interestingly, earlier this season the Sevilla boss dropped a significant hint that he would love to take charge at Barcelona in order to have the chance to manage Lionel Messi.